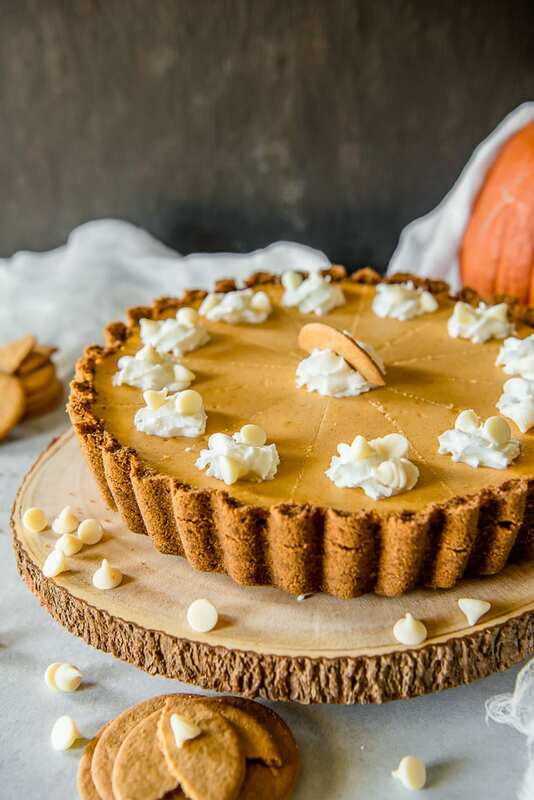 Present that traditional pumpkin pie in a more festive way with this White Chocolate Pumpkin Cheesecake Tart! 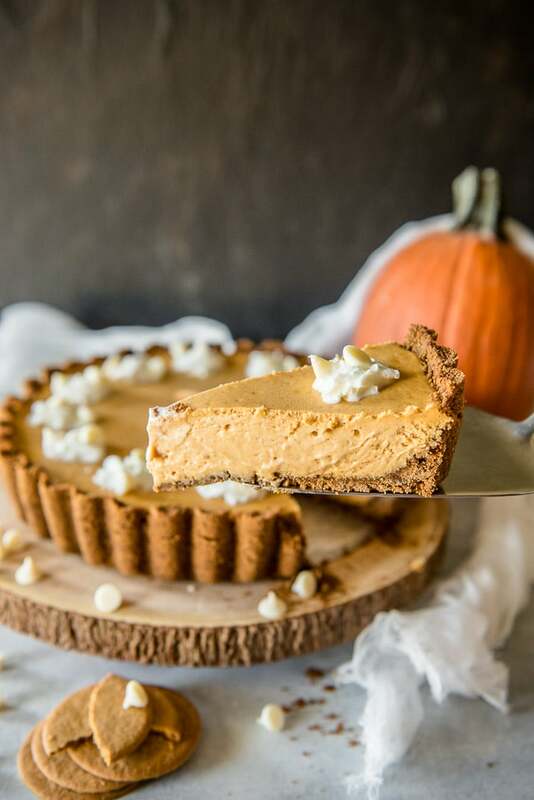 Pumpkin cheesecake, infused with white chocolate and nestled in a gingersnap crust, is going to be your new favorite holiday dessert! As far as I’m concerned, it’s just not the holidays without pumpkin pie. 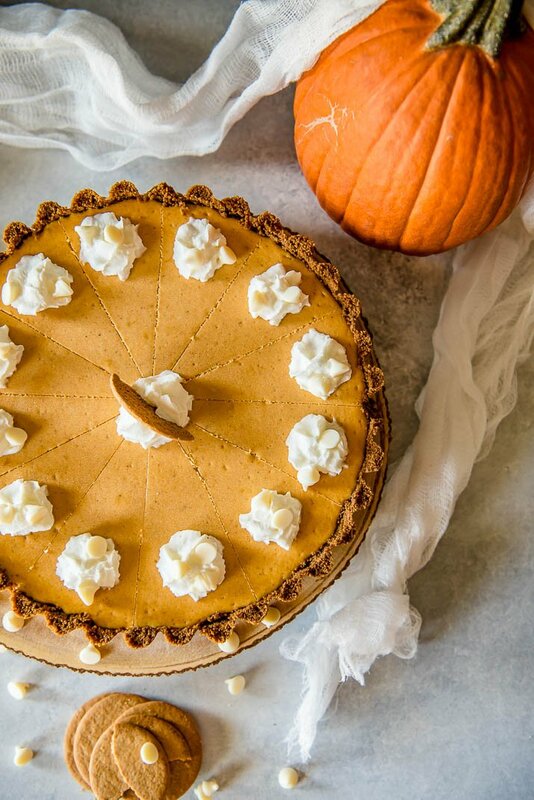 That creamy, dreamy filling, wrapped up inside a delicious buttery crust…the smell alone is enough to send me into a fall dessert frenzy! I’m here today to prove that you can switch up the presentation of this classic pie a bit, and it will still feel (and taste) like the holidays! 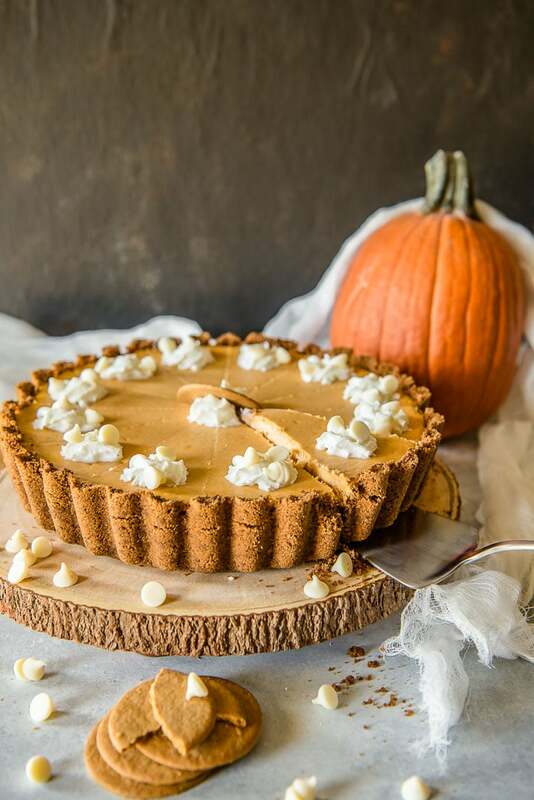 This White Chocolate Pumpkin Cheesecake Tart isn’t quite a pie, or a cheesecake, or a tart for that matter. It’s a fun, festive mashup that will have your family and friends begging you to bring it to your next holiday get-together! I’m one of those basic chicks who starts getting excited for all the pumpkin spice things in July. I’m a Florida native, so by the time Independence Day rolls around, I’m already over summer and all the things that come with it. I’m really a displaced Northerner. My family hails from upstate New York, so I suppose it’s in my blood to crave cool, leaf changing, cider-sippin’ weather. In the last 3 years that I’ve been blogging at The Crumby Kitchen, I’ve amassed well over a dozen pumpkin recipes, from savory dishes to sweets to even a couple of fun cocktails (one of which you Harry Potter fans would love.) I just can’t help but love experimenting with my fave gourd. 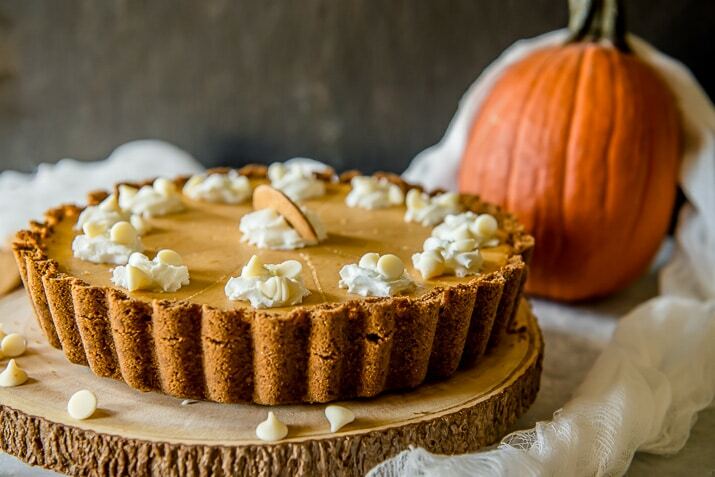 For this cheesecake tart, I was really feeling the pumpkin-white chocolate feels. The chocolate is super subtle, but it adds a bit more sweetness to a dessert that doesn’t really contain a whole lot of sugar. 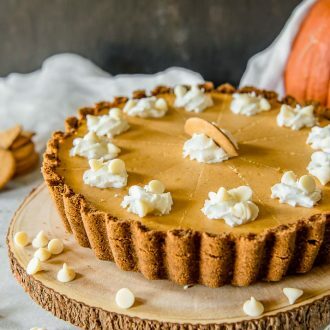 The gingersnap crust has no additional sugar added to the already sweet & spicy cookies, and the cheesecake filling itself has less sugar than a normal one would have. This tart also bakes up like a dream. How many cheesecakes have you made that looked perfect when you cracked the oven to let them cool, then when you come back hours later you find a huge Wolverine-sized gash cut right through the middle of it? You’ll have no problems with this guy, and you don’t have to worry about spilling a water bath all over yourself, either. Tart Pan: I like using a tart pan with a removable bottom like this one for easy baking and serving. Food Processor: The easiest and quickest way to turn the gingersnaps into crumbs is with a food processor or blender. Stand Mixer or Hand Mixer: You’ll want one or the other in order to whip the filling into a creamy and smooth mixture. Pour the cheesecake mixture into the cooled tart crust, spreading it with a spatula to even it out. Bake at 325°F for 30-35 minutes, or until filling is just set. Transfer tart pan to a wire rack to cool completely.